"Darwar" redirects here. For the village in Iran, see Darwar, Iran. Nickname(s): Pedha Nagari, Hubballi-Dharwad City, Dharanagari, Vidya Kashi. Dharwad is the district headquarters of Dharwad district in the state of Karnataka, India. It was merged with the city of Hubballi in 1961 to form the twin cities of Hubballi-Dharwad. It covers an area of 200.23 km² and is located 425 km northwest of Bengaluru, on NH 48, between Bengaluru and Pune. Inscriptions found near Durga Devi temple in Narendra (a nearby village) and RLS High School date back to the 12th century and have references to Dharwad. This makes Dharwad at least 900 years old. Also, there is an inscription at Hanuman Temple at Bokyapur lake near Garag (a village about 18 km from Dharwad). The Chalukyas ruled Dharwad during the 12th century. A stone inscription indicates that there was a ruler by the name of BhaskaraDeva in 1117. In the 14th century, the district was first overrun by the Bahmani Sultanate, after which it was annexed to the newly established Hindu kingdom of Vijayanagar, an official of which named Dhar Rao, according to local tradition, built the fort at Dharwad town in 1403. After the defeat of the king of Vijayanagar at Talikot (1565), Dharwad was for a few years practically independent under its Hindu governor; but in 1573 the fort was captured by the sultan of Bijapur, Adil Shah, and Dharwad was annexed to his dominions. Adil Shah built a fort in an area later called Manna Killa, and later Nazratabad. With this fort, the strategic importance of Dharwad increased and it thus attracted the attention of subsequent conquerors, including Aurangzeb, Shivaji, Aurangzeb's son Mu Azam, Peshwa Balaji Baji Rao, Hyder Ali, Tipu Sultan and finally the British colonizers. In 1685, the fort was taken by the Mughal emperor Aurangzeb, and Dharwad, on the break-up of the Mughal empire, fell under the sway of the Maratha Peshwa of Pune. In 1764, the province was overrun by Hyder Ali of the Mysore, who in 1778 captured the fort of Dharwad. The fort was retaken in 1791 by the Marathas. After the final defeat of the Peshwa by the British in 1818, Dharwar was incorporated into the territory of the British East India Company's Bombay Presidency. During the early 19th century, when the British were expanding their domains, they faced a lot of opposition from local rulers, including Baba Saheb of Naragund and Kittur Chennamma. Dharwad was the home to the movement to unify Kannada speaking areas that eventually became Karnataka state. Dharwad was peaceful for most of late 19th century. During those times, the British started an English medium school in Dharwad in 1848. Later, in 1863, the Basel Mission organization started another school. In 1867 the British opened another school, Varmal school, which later on became known as a training college. 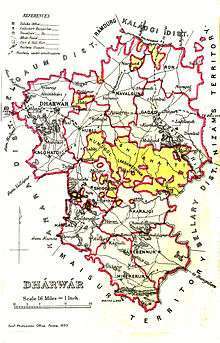 In 1883, the municipality area included Sidapur, Lakamanhalli, Haveri Pete, Bagtalan, Madihal, Galaganjikop, Malapur, Kamalapur, Narayanpur, Saptapur, Atti kolla and Hosayellapur. The British government also established a railway station in 1888. The town had a station on the Southern Maratha railway. By 1901, the town had a population of 31,279 and was home to several cotton gina, a cotton mill, and two high schools, one maintained by the government and the other by the Basel German Mission. After India's independence in 1947, the Bombay Presidency was reconstituted as India's Bombay State. In 1956 the southern, Kannada-speaking districts of Bombay State, including Dharwad, were added to Mysore and renamed Karnataka in 1972. Dharwad is home to the Karnataka UniversityKarnataka University and the University of Agricultural Sciences (UAS) as well as numerous other colleges. In 1941, Dharwad had a population of 47,992. In 1961, the town merged with the adjacent town of Hubballi to become a single municipality, Hubballi-Dharwad. The population of the twin cities is the second-largest in Karnataka, after Bengaluru. Hubballi-Dharwad's population increased 22.99% between 1981 and 1991, from 527,108 to 648,298, and by 21.2% between 1991 and 2001. In the year 2008, a Circuit bench of the High Court of Karnataka was established in Dharwad. In 2013, along with Gulbarga circuit bench, Dharwad circuit bench was upgraded to a permanent High Court bench after president's approval. Very soon the city is going to have a branch of Karnataka Administrative Tribunal (KAT) covering the entire North Karnataka state. The population of the twin cities as per provisional figures of Census 2011: urban population is 1,349,563. Hubli-Dharwad's population increased 22.99% between 1981 and 1991, from 527,108 to 648,298, and by 21.2% between 1991 and 2001. The municipality covers 191 km². Hubballi-Dharwad is located 425 km northwest of Bengaluru, on the National Highway 4 between Bengaluru and Pune. The City is governed by the Hubli-Dharwad Municipal Corporation, having an elected council. Marathi and Kannada are the major languages spoken in Dharwad District. Dharwad is situated on the edge of Western Ghats and hence is a hilly town. Spread over seven small hills at an average altitude of 750 meters above sea level, the city enjoys a salubrious climate amidst thick vegetation. Years ago, Dharwad was known for its lakes but several have now dried out. The lakes that still exist are Sadhankeri, Kelgeri (a man made lake created during British rule, almost 100 years old), Navalur, Hosayallapur and Nuggikeri. The city still has a few more small lakes left, in spite of rapid urbanization. Dharwad sits at the cusp of two distinct geographical divisions - Malenadu (hilly, forest land with red soil) and Belavalanaadu (Deccan plains with black soil). Dharwad has plenty of green cover. Karnatak University's Botanical Garden is a sanctuary for many rare plants, trees and birds. Kelgeri, Sadhanakeri, Navalur and Nuggikeri are also homes for water birds. Dharwad is known as Chhota Mahabaleshwar due to its excellent climate throughout the year. Summers are mildly hot with occasional thunderstorms, lasting from late February to early June. They are followed by the monsoon season, with moderate temperatures and a large amount of precipitation. Temperatures are fairly moderate from late October to early February, with virtually no rainfall. Dharwad is famous for its contributions to Indian classical music and to Kannada literature. It has prestigious educational institutions as well as the main campus of Karnataka University. The Dharwad pedha - a milk-based sweet - from this town is very popular. The Dharwad region has contributed some of the greatest exponents of Hindustani classical music including Sawai Gandharva, Mallikarjun Mansur, Bhimsen Joshi, Basavaraj Rajaguru, Madhav Gudi, Kumar Gandharva and Gangubai Hangal. Currently active artists include Jayateerth Mevundi and Pandit Venkatesh Kumar. Dharwad is also known for the best of its social activities such as Bharat Scouts and Guides, District Headquarters, BS&G, in Karnatak, even at national level. This association is wholly operated / managed by the eminent personalities Such as Shri. Malhar M. Londe and, District Commissioner for Scouts and Guides with support of Mrs. Prabha M. Londe and this association is fully governed, monitored under the guide lines by the Hon. District Collector, Govt. of Karnatak. Hubballi-Dharwad Municipal Corporation (HDMC) was constituted in 1962 by combining two cities separated by a distance of 20 kilometers. The area covered by the corporation is 181.66 km². spread over 45 revenue villages. The population of the city as per the 1991 census was 7 lakhs. The present population is more than 10 lakhs. Hubballi: Under the Government of India Act of 1850, the Hubballi-Municipal council was established on August 15, 1855. Dharwad: The Dharwad Municipal Council first came into existence on 1 January 1856. The first non-official President of the Council was S.K. Rodda in 1907, and Shri S.V. Mensinkai, was nominated in the following year. But the credit of being the first elected President goes to Shri S.G. Karigudari, who took office in 1920. Hubballi is well known as a commercial as well as industrial centre, whereas Dharwad is seat of learning. Popularly believed that, it is this diversity and geographical positions that the state government amalgamated the two cities. 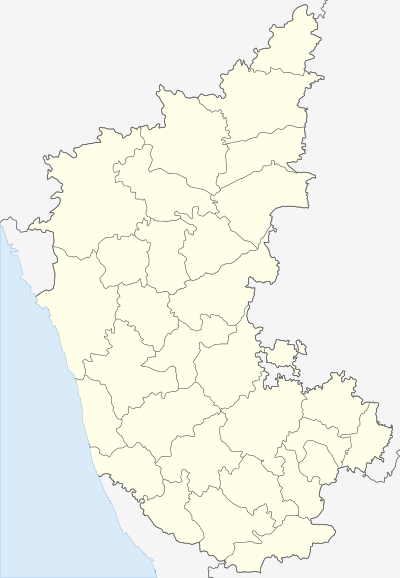 The twin-city corporation occupies unique place in Karnataka State. After the capital city of Bangalore, this is the largest city Corporation in the State. Dharwad cultivates a variety of crops. The Dharwad Cotton Hybrid (DCH), a popular product until a few years back, was invented in the University of Agricultural Sciences, Dharwad. In addition to this, Dharwad produces varieties of channa, kardi, soya and groundnut seeds. Farmers grow sugarcane, paddy, jowar, wheat, green gram, Bengal gram, moong and many other crops. Dharwad Alphonso mangoes and Navalur guavas are famous. One of the largest automotive manufacturers, Tata Motors, has a commercial vehicle manufacturing facility at Dharwad. The unit produces small and intermediate commercial vehicles for the Indian market. The plant is on NH4, 11 km from Dharwad near Belur industrial estate, next to the high court bench of Karnataka, Dharwad. Hubballi-Dharwad is a developing industrial hub in Karnataka after Bangalore, with more than 1000 allied small and medium industries established in Gokul Road and Tarihal regions of Hubli. There are machine tools industries, electrical, steel furniture, food products, rubber and leather industries, and tanning industries. To promote the overall economic development of industries, institutions and businesses, the Karnataka Chamber of Commerce & Industry was formed. It is one of the premier associations, which has been gaining momentum in achieving potential growth and prosperity in Hubli region. One key aspect of industrialisation for Hubballi-Dharwad was foundation of Agricultural Produce Market Committee, which aimed at providing hassle-free market conditions for farmers, to establish regulated and stimulated production of agricultural related commodities and goods. The new generation diesel locomotive shed in the city by Indian railways was another major boost for development of industries in this region. It was the first of its kind in Indian Railways history and created job opportunities for diploma and engineering students of this region. Hubballi Software IT Park is in the heart of the city and is promoted by the Government of Karnataka IT Department and KEONICS acts as the modal agency for maintaining and marketing of IT Park Hubballi. STPI-Hubballi Software Technology Parks of India (organization under the Dept of IT, Government of India) has been operational from May 2001. It is on the 4th Floor of IT Park, to provide data communication, industry promotion and incubation services to IT/ITES industry. Dharwad is well connected by road, rail and air. NWKRTC (North West Karnataka Road Transport Corporation) is a state run corporation headquartered at Gokul Road, Hubballi. There is excellent inter-city transportation between Hubballi and Dharwad as NWKRTC and Bendre Nagara Sarige (a consortium of private bus-owners) healthily compete to cater to the large number of commuters between Hubballi and Dharwad daily. Bus services from the twin-cities exist to every part of Karnataka and neighbouring states and other popular destinations. There are many private bus operators who render services for overnight travel between Dharwad and Bangalore, Mangalore, Pune, Mumbai, Hyderabad. A BRTS project is also proposed to connect the twin cities of Hubballi and Dharwad more efficiently. Several express and passenger trains ply between Dharwad and Bengaluru every day. Hubballi is an important railway junction. Dharwad has daily trains to Gadag, Bagalkot, Vijayapura, Solapur, Ballari, Belagavi, Bengaluru, Mumbai, Davangere, Pune, Delhi, Visakhapatnam Hyderabad, Ahmedabad, Vijayawada, Mysore, Tirupati and weekly services to Chennai, Howrah and Thiruvananthapuram. 12725/Siddhaganga Intercity Express terminates in Dharwad Station. Hubballi has an airport on Gokul Road IATA code: HBX. AirCosta provides flights to Bangalore and Mumbai. Dharwad is an educational centre and students from far off places come to study. Hubballi-Dharwad twin cities are well provided with Schools, Polytechnics, ITIs, Colleges and Universities. There are engineering, medical and dental colleges as well. Colleges and Universities offer fields like Management, Law, Education, Ayurveda, Homeopathy, Physiotherapy, Nursing, Arts, Science, Commerce etc. Cricket is the most popular sport in the city. There is ground called Town Planning Authority Ground that has hosted a cricket matches. In 1973 when Karnataka cricket team played against Tamil Nadu cricket team. but since then the stadium has not hosted any cricket matches. Dharwad is the birthplace of Palwankar Baloo, the first member of the Dalit (or "Untouchable") caste to distinguish himself at cricket. He later became a political activist for Dalit rights. There are many spiritual personalities associated with this laid-back town. Some of them are Shishunala Sharif Saheb, Siddharoodha Swamigalu, Kumara Swamiji, Hurakadli Ajja, Mrityunjaya Appagalu, Mahanta Appagalu, and Garag Madiwaleshwara. The Karnataka Vidyavardhaka Sangha was founded in Dharwad. 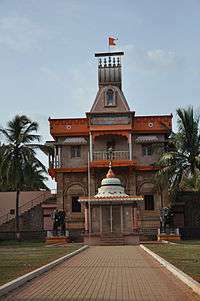 Dharwad is the cultural capital of North Karnataka. Chandramouleshwara Temple A temple of Chalukya times, dedicated to god Chandramouleshvara (another name of Shiva), with impressive architecture can be seen in Hubballi. A hillock which serves as a picnic spot for the citizens of Hubballi-Dharwad. A pictorial water spot with a magnificent sunset view, this perfect picnic spot has green garden, recreational facilities for the children, boating facilities, etc. The lake is 6 km from Hubballi. This is a public garden with recreational amenities maintained by city municipality. It houses a large glass building resembling a similar structure in Lalbagh of Bengaluru. Indira Glass House has been renovated into a more beautiful park. The entry fee here is ₹ 10 for elders and ₹5 for children. Inside the park is a small toy train in which you can get on and enjoy the park. The most beautiful and interesting thing to be watched here is the 'musical fountain' performance, that is arranged on every weekend i.e. Saturday and Sunday and on Governmental holidays without any extra charge. Near Karnatak University Campus, Dharwad, is the Science and Cultural, a museum in Dharwad which is well organised and maintained with full of information about the science / technology and knowledge about the ancient history of Indian villages/culture. It is really wonderful place to see as sight seeing spot for the Dharwad-ians and outsiders who wish to visit Dharwad on tourism or a day picnic, too. It is really very educative/entertainment interactive museum for the students from 1st Standard to 10th Standard. ↑ "Imperial Gazetteer2 of India, Volume 11, page 316 - Imperial Gazetteer of India - Digital South Asia Library". Dsal.uchicago.edu. Retrieved 2009-11-15. ↑ "Census of India 2011 Provisional Population Totals" (PDF). ↑ "What is it about this place?". Tehelka. 19 Mar 2011. ↑ "Home - ಹುಬ್ಬಳ್ಳಿ-ಧಾರವಾಡ ಮಹಾನಗರ ಪಾಲಿಕೆ (Hubballi-Dharwad Municipal Corporation)". ↑ "about hubli – dharwad" (PDF). 1 2 "HDMC ABOUT TWIN CITY". ↑ "Gokul Road (Hubballi (Hubali))". ↑ "Tarihal - Google Maps". 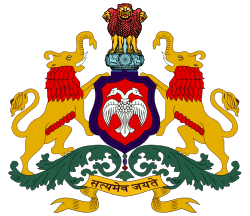 ↑ "Karnatak Chamber of Commerce and Industry". ↑ "Welcome to SOUTHWESTERN RAILWAY". ↑ "The Home of CricketArchive". Retrieved 1 October 2016. Wikimedia Commons has media related to Dharwad.